The castle of Wark on Tweed, the defensive Work (hence, Wark) of Carham, lies at the west end of the modern village of Wark on the south side of the River Tweed, which at this point forms the border between England and Scotland, where it occupies part of an elongated glacial mound or ‘kaim’, a mini-escarpment rising abruptly from the south and extending east and west for some 300 metres each side of the motte. The greater part of the castle and modern village are located on the north side of the kaim, where the land dips gently away to the north before rising slightly to the riverbank, ending in a cliff up to 15 metres high. Sitting opposite Wark on the north flood plain of the river Tweed is the farmstead and hamlet of Fireburn Mill, bounded on its north side by the Kelso-Coldstream road which forms a junction here with the A697, an ancient route to Edinburgh. Fyreburne Mylne forde is, with Saynte Gillyforde on its west side, one of two fords mentioned on the immediate west side of Wark castle - one of 10 between Cornhill and Carham - in a Border Commissioners report of 1541. The landscape of Wark on Tweed site is dominated by the earthwork castle mound, raised on the centre of the kaim, with the Middle and Outer Wards positioned to the north on gently undulating ground between the kaim and river cliff. Much of the inner bailey is now overgrown and waste ground, while the Outer Ward contains modern buildings and open spaces. Stonework remains of the castle are very fragmentary and, apart from sections of heavily overgrown curtain walling, there are no surviving standing medieval structures. Indeed, the covering of vegetation is so complete on the south and east sides that visitors from the direction of Cornhill see only a green mound that it not immediately identifiable as a castle site. Visitors approaching by car from the west may catch glimpses of stonework within the grassed-over west elevation of the castle mound, but the view is impeded and confused by the presence of the kaim, which, although perhaps modified in places, is substantially a natural feature. In addition to the area bounded to the north by the river Tweed between the former ferry and ford crossings, and to the south by the present Cornhill-Carham road, the castle site also includes, or is associated with, a gently undulating terrace above the river Tweed which extends from the west side of the motte to a point just east of St Giles’s chapel cemetery, which lies on slightly lower ground. A break in the kaim at this point gives access to St Giles’s chapel site from the south, but a short distance to the west the kaim tapers and disappears. The principal published accounts, which summarise the known history of the castle derived from the corpus of chronicles and documentary sources, include those provided by Bates in his work Border Holds of Northumberland (1891, 331-59), by Vickers in Volume XI of the Northumberland County History (1922, 44-74) and by Hunter Blair in the Proceedings of the Berwickshire Naturalists Club (1935-7, 76-103). The latter published for the first time two 16thcentury plans of the castle. Volumes II (Colvin et al. 1963, 852-3) and IV (Colvin et al. 1982, 688-94) of The History of the King’s Works provides the most authoritative analysis of the works undertaken in the castle in the periods when it was in royal hands during the Middle Ages and more importantly with regard to the complex sequence of renovation, modernisation and repair undertaken by the Crown during the 16th century. While prehistoric settlement activity in the vicinity of Wark is attested by lithics and cropmark sites and the topography of the castle site itself suggests that it may well have been settled prior to the establishment of the Norman castle, no evidence for occupation prior to the early 12th century has yet been found. The recorded origin of the castle site is as a motte and bailey earthwork castle, presumably with timber keep, built during the reign of Henry I (1100-35) by Walter L’Espec (d.1153), who had been granted the honour of Carham by Henry I. After being destroyed in 1138, the castle was taken into royal hands by Henry II and rebuilt in 1158-61, perhaps at least partly in stone. Thereafter it passed in and out of Royal hands, although even when in private hands both Henry III and Edward I made temporary use of the castle on several occasions in the 1250s and 1290s/1300s. After briefly falling into Scottish hands in 1318 the castle was described as ‘ruined and broken’ in 1329 when the Crown again relinquished control. In the turbulent 14th and 15th centuries there are repeated references to the defences being slighted and its walls beaten down but stone castles were difficult to destroy completely before the widespread availability of gunpowder and some of the damage may have been less extensive than the chroniclers might imply. The overall impression is that the castle was not subject to any major remodelling after the work of Henry II, although continuous repair would undoubtedly have been necessary prior to the works subsequently undertaken by the Crown during the 16th century. By the early 16th century the castle had grown to consist of three wards, visible on 16th century views of the castle by Rowland Johnson, Antonio da Bergamo and an anonymous bird’s eye view reproduced by Hunter Blair (Wardle and Nolan 1997). These comprise an inner ward at the southwest corner of the castle complex, defined by the extent of the Ring, with middle and outer wards occupying the area between keep and river cliff as far as the west side of the western of two access routes into the village from the main southern through road. The boundary between the middle and outer wards is defined by the current access roadway to the gamekeeper’s cottage, formerly the Salmon Inn above the old ferry landing (formerly Gillies ford). It appears likely, however, that the rest of the area defined by the current village, which occupies the area between kaim and river cliff from the castle motte as far east as a traditional fording point next to Wark Farm, served in the medieval period as an extra outer ward, perhaps occupied by a permanent civilian population (thus equivalent, perhaps, to a Roman vicus) but providing an enclosed area for use as refuge by the wider population and its stock during times of military threat, or for billeting large numbers of men mustering in advance of campaigns to the north. The area to the west of the motte has been suggested as serving a similar purpose and is the subject of fieldwork investigations described below. Successive spells of royal tenure mean that works on the castle are recorded in a much more copious body of documentation than would be the case for an equivalent baronial castle. This material includes some highly detailed reports outlining the state of the castle or listing work recently accomplished, notably a paymaster’s account book for works at Wark between 12 February and 10 November 1543, of which only a one page abstract has hitherto been published (Bates 1891, 349-50; cf. Colvin et al. 1982, 691).The period of current interest is covered principally by the Letters and Papers, Foreign and Domestic, of the Reign of Henry VIII, preserved in the Public Record Office (London, 1862-1932). The castle also figures in a succession of overall surveys of the state of the Border defences undertaken by crown officials in 1415, 1541, 1550 and 1584 reproduced by Bates and Hodgson (1415: Bates 1891, 14; 1541: Bates 1891, 30, 347-9, and Hodgson 1828, 179-82 fn; 1550: Hodgson 1828, 201-3, Bates 1891, 350-52; 1584: Bates 1891, 72), and is also unusually well-represented by 16th century plans and illustrations. The principal early 16th century descriptive surveys with relevance to the Flodden campaign and its aftermath are Lord Dacre’s report of 1519 (Bates 1891 342), Hart’s Inspection of 1522 (L&P Hen VIII Addenda 837), a 1523 Survey (L&P Hen VIII iii, 8286), Sir Robert Bowes and Sir Ralph Ellerker’s Border survey of 1541 (in Hodgson 1828, 179-82) and Sir Robert Bowes Book of the State of the Frontiers and marches betwixt England and Scotland, 1550 (Hodgson 1828, 201-3). Repairs and alterations carried out to the castle in the aftermath of the Flodden campaign began in 1517-19 with works supervised by Lord Dacre when the keep was rebuilt to house artillery. In the period 1522-23 further works were carried out, modifying the original design to give the keep a flat roof so that artillery could be mounted upon it, and in September 1523, in preparation against Scottish attack, the Earl of Surrey ordered new bulwarks and other defences with earth and timber to be erected, again presumably to support artillery pieces. Dacre supervised further repairs in 152426 following an unsuccessful two-day siege by Albany in November 1523. 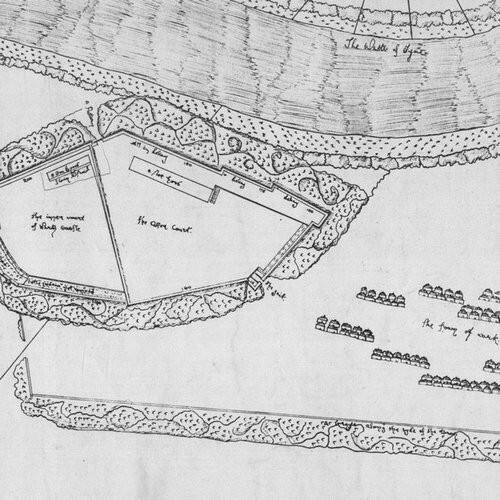 The period 1542-50 saw the construction of the artillery fortification, first referred to in a survey of 1561 as ‘the Ring’, around the motte [Hunter Blair, p76], transforming it into a raised and revetted, level platform for artillery, approx. 7.3 m high and 1.83 m thick, with twelve embrasures for cannon which stood on a platform inside the wall. At the centre of The Ring stood the earlier keep. Work was also begun at this time on the building of an inner wall, parallel with the south and east walls of the middle court, extending as far as the cross wall separating the outer and middle courts/wards, with the intervening space being infilled to provide a level, 20ft wide artillery platform along these sides of the middle court, similar to the Ring itself. 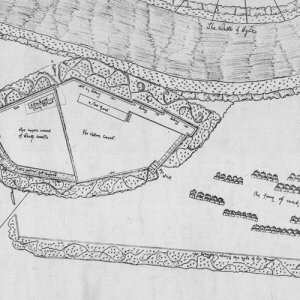 The raised artillery batteries along the inner face of the north, riverside wall may also have originated in this period. In 1592-97 further repair works were carried out, notably to the north, ‘water wall’ above the Tweed, but by 1633 what remained of the artillery had been removed, and in 1639 the castle was described as ‘ruinated’. Relatively little archaeological work has been carried out at Wark, though limited excavations were undertaken on top of the motte in 1862, revealing the remains of a flight of steps on its east side (Mearns 1863-8, 61-6). More recently a survey of the castle earthworks was undertaken by the RCHME in 1992 (Welfare et al. 1999, 53-5, fig. 19) and Newcastle City Archaeology Unit undertook archaeological recording whilst monitoring conservation works on the 16th century artillery fort and the north curtain wall of the middle bailey, as well as the construction of a retaining wall to support the north face of the castle mound (Wardle & Nolan 1997). Although limited in scope, this work led to a better understanding of structural phasing, notably that differences in the corework of The Ring and a very small section visible on the south curtain suggest that the latter is not part of the 1543 refortification and may be a remnant of an earlier phase of construction. Above Right: Plan of west-facing section of pit 72 and post-hole 69. The survey and excavation work carried out within and west of Wark Castle between 2012-15 has for the first time proved that significant archaeological remains, suggestive of intensive military activity over a considerable period of time, exist in the area west of the castle. The suggestion made, therefore, by Flodden 500 archaeological director Chris Burgess at the outset of investigations, that this area should be considered as an additional, or auxiliary outer ward of the castle, much like the area similarly regarded on the south side of Norham castle, has been verified. However, although this conclusion applies to the medieval castle it has not been shown to apply to the early 16th century castle, since no diagnostic remains of that period were found during fieldwork, although it is suggested that the substantial boundary feature uncovered at the west end of the site was built as a result of recommendations for strengthening the castle following the Flodden campaign. The work completed as part of the Flodden 500 project provides the foundation for future work in the same area which should aim to determine questions posed in this discussion, including the extent of pits and putative related structures in the area north of St Giles’s Chapel, the relationship between these and the chapel itself and the date of construction of the linear, reveted earthwork feature forming a boundary between St Giles’s chapel complex and raised platform of land to the east. Other questions also persist, such as the dedication of the current chapel remains to St Giles’s when Gilly’s Ford, noted above, is the easterly of the two fords mentioned in 1541 west of the castle, and must lie east of Fireburn Mill which, in turn, is east of the current St Giles’s chapel. Could it be that the dedication to St Giles’s refers to a chapel formerly situated within the castle complex itself, while the chapel currently known as St Giles’s, lying outside the western limits of the castle, is another establishment altogether, perhaps a hospital or monastic site? Bates, C J, 1891, ‘Wark Castle’ (in) The Border Holds of Northumberland,. Archaeologia Aeliana 2, XIV, 331-369. Bowden, M, RCHM(E) Survey of Wark-on-Tweed Castle, March 1992. RCHM(E). Colvin H M, Allen Brown R and Taylor A J, 1963, History of the King’s Works; Vol. 1: The Middle Ages. HMSO; London. Colvin H M, Summersen J, Biddle M, Hale J R and Merriman M, 1982, History of the King’s Works; Vol. 4: 14851660 (Part II). HMSO; London. Hunter Blair, C H, 1935, The Castle of Wark-upon-Tweed, Proceedings of the Berwickshire Naturalists’ Club 29, 76-103. Mearns, P, 1868, Wark Castle, History of the Berwickshire Naturalists Club, Vol. V, 1863-68. TAP (The Archaeological Practice Ltd.), 2012, Wark on Tweed Castle, Northumberland: Options appraisal for community involvement and access improvements. Unpublished report prepared for Flodden 1513 Ltd.
Tate G, 1868, Wark Castle; in Berwickshire Naruralist’s Club 5, 427-37. WARDLE S & NOLAN J, 1997, Wark Castle Archaeological Recordings. Unpublished Report by Newcastle City Archaeology Unit for Northumberland County Council. Welfare, H., Bowden, M., and Blood, K. 1999 Fieldwork and the castles of the Anglo-Scottish Borders, in Pattison, P, Field, D and Ainsworth, S (eds) 1999, Patterns of the Past: Essays in Landscape Archaeology for Christopher Taylor, Oxford and Oakville, 53-60.